30 numbers; 1.75" in height. - three helmet decals of each number. Sport helmet number decals in a variety of single colors or colors of the pro teams, great for your team helmets! Add a number to your helmet matching the color of your team! We have helmet number packs for individual helmets, and also for team helmets. 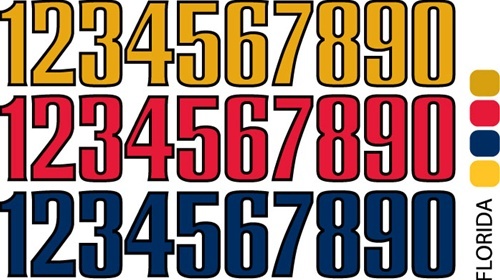 We make hockey helmet decals and hockey helmet numbers in a variety of colors. Please ask us if you don't see the color that you need. Helmet decals, hockey helmet numbers, football helmet numbers, baseball helmet numbers, sport helmet numbers.... stock or custom, we can make them all!